Day Four of the Olympic Food Challenge. Wasn't the opening ceremony amazing last night? Not normally my kind of thing but I twisted the husband's arm and I'm so glad I did. Aside from the obvious things I could mention like Becks in a speedboat, Daniel Craig and her Maj and Cav's eyelashes, it was just brilliantly bonkers and brilliantly British. The only disappointment was Macca at the end. Why, why, why does he just plain refuse to sing The Frog Chorus? Just think what Danny Boy(le) could've done with that! Anyhow, today's pick was Senegal who held Team GB to a one-all draw in the opening men's football match. They're fielding 35 athletes across a variety of disciplines, having come a long way since Tokyo in 1964 where they were exclusively involved in athletics. (Thanks to the London 2012 website!) Located on the coast of West Africa, and with a population of just under 13m, Senegal's cuisine is largely influenced by French, Portugese and North African cooking. The recipe I selected today is a starter to a menu for dinner for eight. 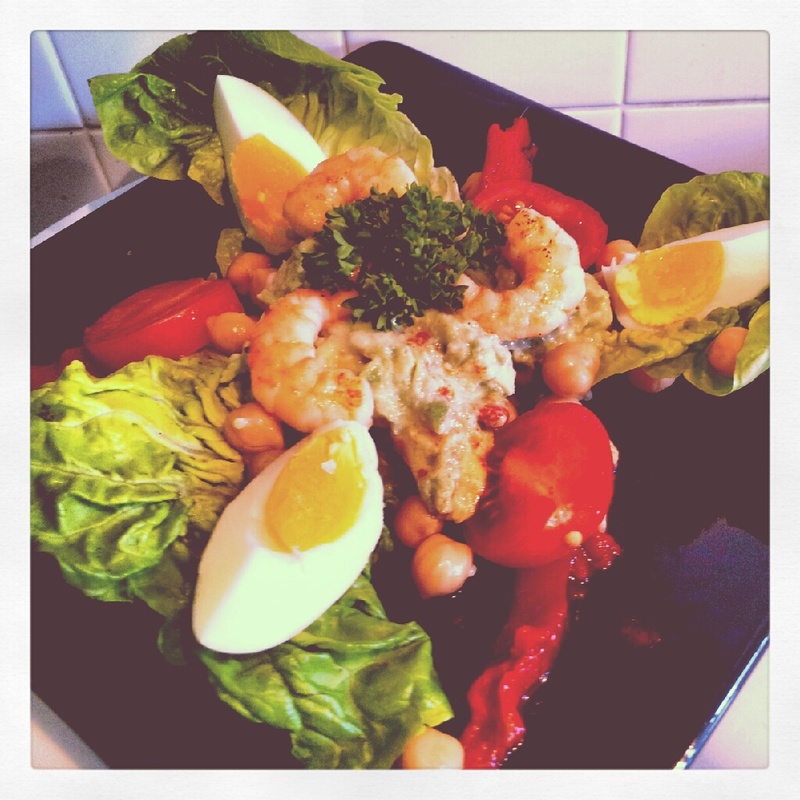 I wanted something I could make for lunch and I just loved how delightfully Seventies the dish is. 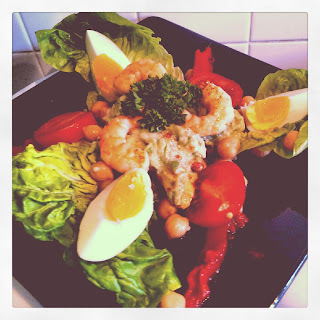 Basically, it's a posher version of prawn cocktail with avocado, eggs, chickpeas, tomatoes and peppers thrown in. The recipe says that it's a bit complicated. The most complicated part was dragging all the ingredients from their various locations and then attempting to follow the faffy plating up. I've admitted before that my presentation was lacking so in some ways it was refreshing having someone instructing me exactly what to do but even then I did my own thing - using three Little Gem leaves rather than a pile of shredded lettuce and adding an extra quarter of egg to keep the 'power of three' layout evenly balanced. It was so Seventies-tastic, right down to the instruction to garnish with parsley (I had flat leaf and curly to hand but this just screamed for curly! ), that I duly Instagrammed it with the 1977 filter. The first time I've ever used that one. Taste wise, it was an interesting combination. The avocado, lemon and yogurt worked well. The chickpeas were a bit of a curve ball and not something I'd look to do again in a hurry but they bulked it out nicely to make a decent lunch. I liked the vibrant reds and yellows as prawn cocktail, much as I love it, can often look a bit insipid. Probably a bronze in the grand scheme of things. You can find the recipe here.